So I was just ecstatic when F & F contacted me and ask whether I would like to cure my January Blues with a Bloggers Night In Survival Kit. Yes F & F... yes I really really would! Not only that but this kit was for me AND a friend - and I knew exactly who I was going to pick! February is a month I always look forward too (hello birthday!) and not only is it my big 2-4 next week but I'm also going to see Taylor Swift - something I've wanted to do for the probably the last 4 years or so! So it was time for a cosy night in with my pal to relax, chill, eat, watch and organise our trip to London! What better way to cure the January Blues than to have a perfect night in and something to look forward to in February aswell! My box arrived and I was overwhelmed by the sheer size and weight of it - what could be in there? I literally had no idea what to expect and I could not believe what I found when I opened it! 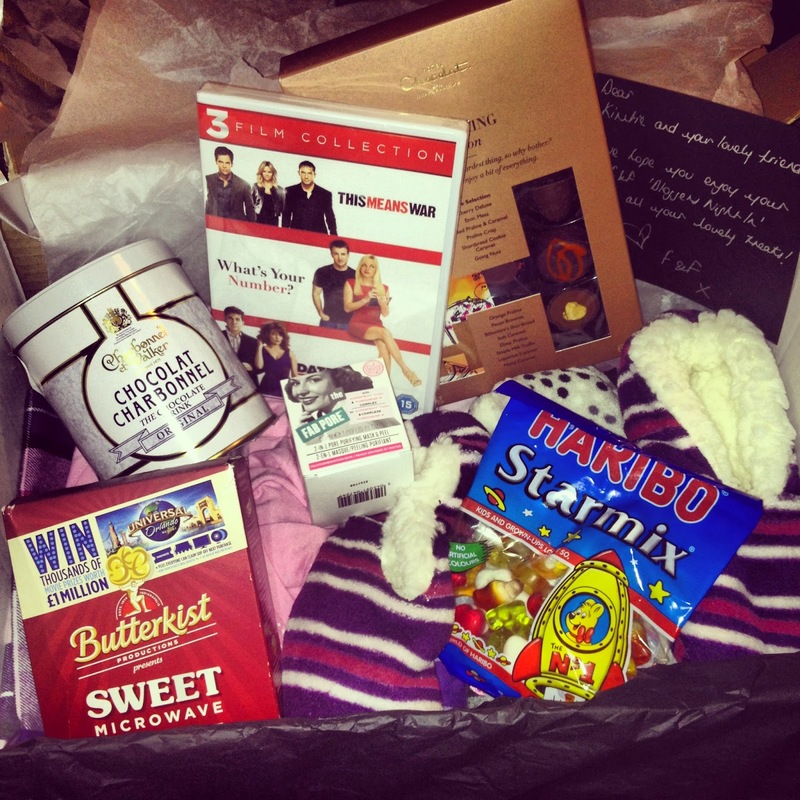 Pyjamas each, slippers each, 3 amazing girly chick flicks, an amazing soap and glory face mask, popcorn (our favourite food), some insanely good chocolates, hairbo and some yummy hot chocolate. I could not believe my eyes - major girl time was happening ASAP! So the next night my lovely friend came up to my crib, we got in our new pjs and slippers (which can I just say are amazing! ), ditched the make-up and shoved our hair up - it was time to hit the sofa (aka the most comfiest thing ever!). We'd both been on diets so a cheat night was definitely on the cards and seeing as F and F had totally spoilt us with incredible snack choices, we dug straight in! Popcorn, sweets and the most amazing chocolates I've ever eaten. These were chocolates by a brand called Hotel Chocolat - and OMG I need to go to this hotel in London. Literally some of the best chocolate I have ever eaten.... and that is one serious statement from one serious chocoholic right here! As soon as I am in Tesco next my mission is to find them! Should we be ashamed we polished off 2 bags of popcorn with ease? Nahh... never! Not only did we have yummy treats and obviously great conversation (duh) but the TV and DVD player to ourselves (no men in sight!). F & F had sent us a fab choice of girly chicks flicks -What's Your Number? is amazing! AND we had the joys of Celebrity Big Brother ... man it is addictive! We booked up our exciting trip to London - wahhooo something to look forward too and I'm sure I'll be blogging all about it! Also... Soap & Glory facemask? FABULOUS! I'm thinking of doing a whole review post on it... what do we think? A perfect Friday night in it was and I would like to say a huge huge huge thank you to F & F who made it possible, me and my friend couldn't have planned a better night in ourselves and we were so overwhelmed and grateful with everything they treated us with! 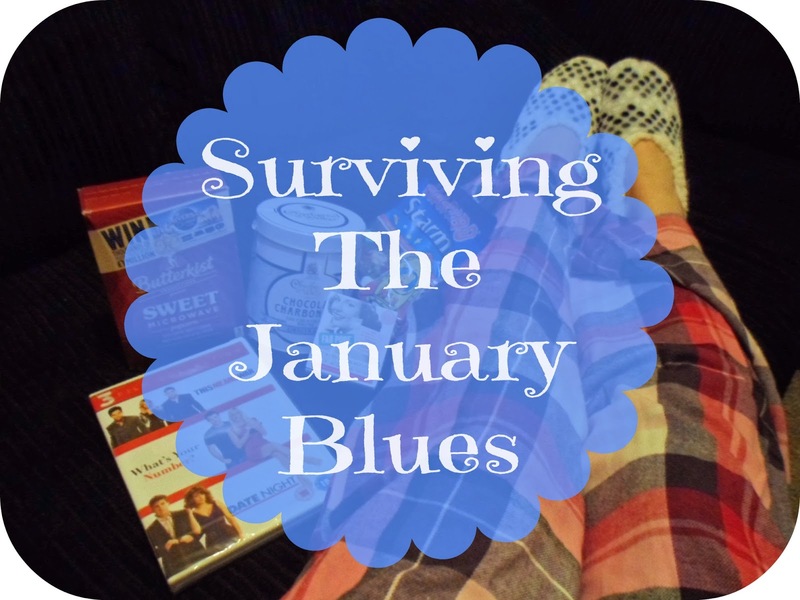 So it is true, the January Blues CAN be cured, just one night, one good friend and some fabulous treats and entertainment and the fact we are poor and it is still January just fades away! So whether it's January, February or even bloomin' August if you need a pick me up - a cosy night in with a friend or ten is definitely the way to go! I love your PJs! And how generous of them. Ahh this is such a good idea, definitely could of done with this a few weeks ago. But I am sure I would use something like this in Feb time.